The Flower Carpet Rose is a disease-resistant, low-growing shrub which requires none of the usual care that other roses do. Not only does it produce thousands of blossoms over the growing season, but it is virtually care-free. Deadheading, pruning, spraying and constant feeding are all unnecessary to keep these plants looking their best, although deep watering is suggested for new plantings. 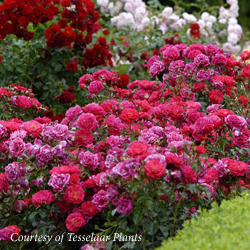 Once established, Flower Carpet Roses can become quite drought tolerant. Flower Carpet Roses can be used in a variety of ways in the home garden. These plants are wonderful for foundation plantings, for covering sloping banks, to line a walkway or driveway, in large containers, alongside a quaint fence or simply mixed in among other flowers in perennial borders. The Flower Carpet Rose can go anywhere and still look spectacular. More adventurous gardeners may even want to train these roses into tree forms for amazing specimens and landscape focal points. They work well in terraces or other hard-to-reach locations, can help with erosion control on steeper slopes and are beautiful alongside water features or to create a welcoming, colorful entryway. Just be sure that wherever you position the plant, it will have adequate room to spread out to its full potential and blooming glory. 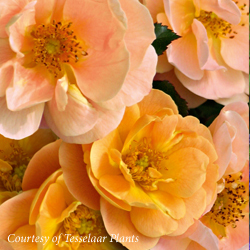 Full sun is preferred for the best, most prolific blooming, though these roses will still bloom in part shade locations, albeit not as prolifically or for as long throughout the season. Flower Carpet Roses are a top ground cover rose and can flower for up to 10 months (depending upon climate and soil condition), producing up to 2,000 blooms from spring to fall. Rich, glossy green foliage also adorns this full, rounded shrub and provides a luscious contrast to the blooms, which come in pink, red, yellow, peach and white hues, as well as subtly variegated shades. 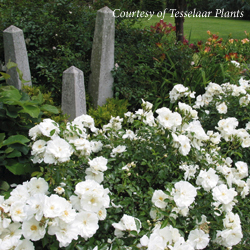 Even when the blooming is finally finished, these roses stay neat as the foliage and spent blooms drop cleanly away – no deadheading or cleanup intervention required. To keep the shrub in shape, just cut back with shears to 1/3 size in early spring to keep them as a mounding form. Even pruning novices can manage this task – these roses aren’t fussy about the type of cuts or the direction in which they’re made. Flower Carpet Roses are every gardener’s dream – virtually care-free, trouble-free plants that produce masses of colorful flowers throughout the growing season. Who could ask for more? Except, perhaps, more room to plant them!